Fund houses are actively promoting their online transaction portals. You can now buy the latest mobile phone or laptop over the internet, then why not mutual funds (MFs)? Fund houses and online portals are increasingly getting sensitized to this issue. While online portals are slowly proliferating, fund houses are also actively promoting their online transaction portals. Here’s a guide on how to buy or sell MFs online. Online transactions are on the rise. HDFC Asset Management Co. Ltd, the country’s largest fund house with assets of about 1.02 trillion, claims that it has at least 350,000 H-Pin users (HDFC AMC’s online password is called H-Pin); a number which was around 100,000 till two years back. At the most basic level, fund houses have websites wherein you can transact. You need a username and a password or a personal identification number (PIN) to transact. Transacting on several fund websites mean you need to remember as many PINs. This could be daunting. Enter online transaction portals such as Fundsindia.com and Fundsupermart.com. Launched in June 2009, Fundsindia.com has impressive numbers. At present, Fundsindia.com claims to have over 25,000 customers. Open an online account, quite like you open a new email account, fill up a form online, take a printout of this pre-filled online form, sign it, attach a copy of your Permanent Account Number (PAN) card and know-your-client (KYC) acknowledgement and send to Fundsindia.com. Once this is done, you’re good to buy MFs across 41 fund houses. Fundsupermart.com, started in September 2009, has about 3,500 customers. Except for Sahara Asset Management Co. Ltd and Escorts Asset Management Co. Ltd, you can buy and sell schemes of all other funds houses. “Over the past few years, there has been a lot of push for online transactions. Fund houses, too, have been sending out mailers to their investors nudging them to move online", says Rajesh Krishnamoorthy, managing director, iFast Financial India Pvt. Ltd, the firm that runs Fundsupermart.com. You can also buy MFs from bank’s website or even with an online brokerage account. Another interesting option is an online tool called Scripbox. Launched in November 2012, this is a basket of four funds that the firm recommends. The basket is reviewed once a year. It absolves you of research and gives you a ready basket to invest in. The entire process for Scripbox is online. If you are an existing investor and have been investing in the traditional way of filling forms, some MFs allow you to buy units online without registering initially. Once you enter your folio number, bank account number (which is registered with your MF folio) and PAN, you are directed to your own bank’s internet banking website. Enter your bank’s internet username and password, enter the amount and your transaction is complete. Once you do that, you need to apply for a username and PIN to do further transactions such as a switch or redemption. First, link your bank account by registering your fund house in your internet banking under Real Time Gross Settlement (RTGS) payment system. For this, you need the bank account details of your fund house; you’ll find these details on the fund house’s website or you can call the fund house. To buy a scheme, log into your internet banking, select the payee fund house under RTGS system, select an amount, transfer the amount and get the RTGS transaction number. Then, go to your fund house’s website, log into your online MF account, select your schemes and quote your RTGS transaction number. For systematic investment plans (SIPs), the system works a bit differently. You need to add your chosen fund house as a biller in your internet banking website, just like you add a utility (electricity or telephone) to pay your monthly bills. Once you get your KYC in place, open an account with an investment portal, take a printout of the pre-filled application form, sign it and send it with a cancelled cheque and a KYC acknowledgment copy to your online portal. Registering for SIPs is a lot simpler here than doing the same with fund houses’ online portals. Once you fill the bank mandate form on your online portal’s website, take a printout, attach a cancelled cheque leaf and send it back. SIPs are flexible as well. For instance, Fundsindia.com gives facilities such as choosing any day for SIP, limiting SIP instalments when your MF account balance hits an upper limit, change of scheme and/or amount by just sending an email an so on. “These flexibilities come in electronic form and are impossible in the offline mode", says Srikanth Meenakshi, director, Fundsindia.com. Fundsupermart.com allows you to, amongst other things, decide an upper limit of monthly instalments straightaway but allows you the flexibility of choosing schemes and amounts at your convenience. Some banks offer MF services online through an online investment account that you need to open separately. These banks, typically, mandate that you must also have a bank account with the same bank. Charges are nominal mostly. Then, there are online brokerages such as ICICIdirect.com that offer equities as well. If you wish to stick to buying just MFs, only an investment account and a bank account (from within the same group, if it has a bank within) are required. But if you wish to also buy equities, you will also need a demat account. ICICIdirect.com charges about 250 for opening an account, which it refunds back to the customer over a period of time as a cash-back offer depending on the investor’s activity. Many online brokerages also allow you to map existing MF investments with your investment account. Just make sure you are knowledgeable enough to choose MFs. “There are many advisers who advise you first and then help you invest online. 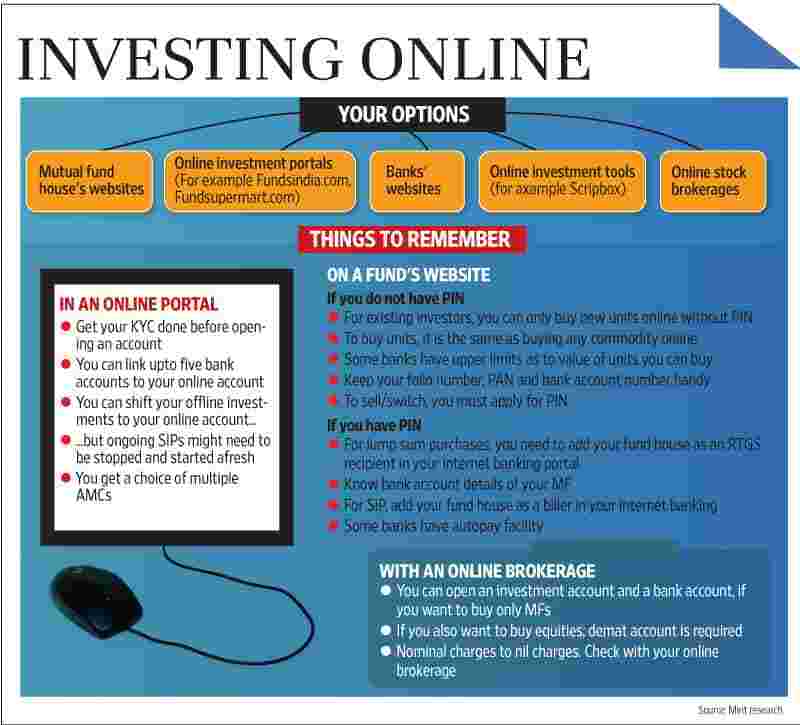 But investing online, if you are not equipped to choose the right MF scheme, can backfire if you just go by the information boom", says Ajit Menon, head of sales at DSP BlackRock Investment Managers Ltd. If you think that you need advice before investing, it’s safe to stick to a good financial planner or adviser.